Last week, Booker wrote that the core reason why we have been making such an unholy mess of Brexit is how little our politicians seem to understand how the strictly rules-based EU system works. In this week's column (no link yet), he remarks that this was confirmed in spades by a report of last Tuesday's "stormy" Cabinet meeting at which ministers apparently "greeted with disbelief" the news that the Government is planning to charter ships to ensure that, post-Brexit, we can continue to import the 30 percent of all our food which we import from other EU countries. This is something I picked up on the blog last Wednesday and Booker takes up the theme and runs with it, Most of the food imports, he notes, arrives via the hyper-efficient. 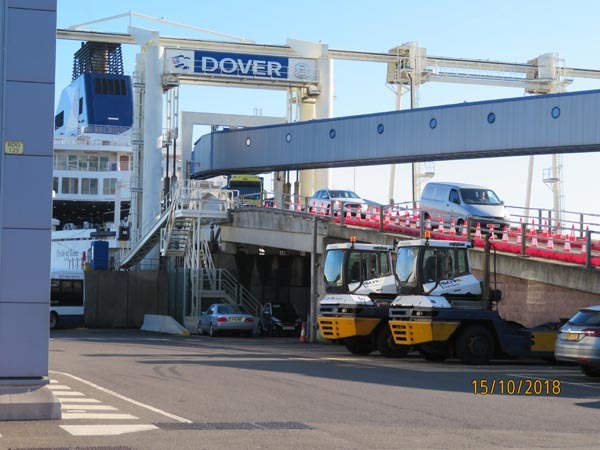 round-the-clock roll-o roll-off ferry service which carries 2.5 million trucks a year between Calais and Dover. But when we drop out of the Single Market, making inevitable border controls on all our frontiers with the EU (much more than just customs controls), this service will slow to only a trickle. Our politicians, says Booker, should have known this long ago. He has, after all, been writing about this since early last year. Apparently, the Government's idea is that, with the end of the roll-on roll-off ferry service, all these imports in its newly hired ships will have to be diverted to other ports. So most of this food will have to be imported in shipping containers, rather than in trucks which can be driven straight on and off ferries with the minimum of delay. Not only does container-shipping take longer (with loads often having to be checked in 24 hours before sailing), there will be time-consuming border inspections, adding to the inevitable delays. Perishable foods, from dairy products to lettuces and tomatoes from Spain, will lose days from their allocated shelf-lives, reducing marketability and value. That also assumes that there will be sufficient numbers of the special refrigerated containers (known as reefers) to take the extra traffic, and that low value, high volume products can bear the extra shipping costs, and the inspection and handling fees. In fact, much of the traffic generated is a child of the Single Market. We are now used to the idea of buying lettuces throughout the year, with fresh strawberries and raspberries still in the supermarkets in late autumn, at knockdown prices. People have forgotten what seasonal means, and will have to re-learn to go without some foods for prolonged periods. Ministers, however, seem to have been told that all this can sorted simply by redirecting goods through different ports, with no understanding of the ramifications. This is not going to be the case. As Booker has so often said before, if only we had retained our "frictionless" access to the Single Market by joining Norway in Efta and thus remaining in the EEA, virtually all these problems could have been avoided. But even when our politicians finally begin to wake up to what our decision to leave the Single Market means in practice, they still don't seem to know the half of it. Recently, however, we have been seeing an upsurge of interest in the Efta/EEA option, but only in terms of the "Norway then Canada" – the idea being promoted by Nick Boles which involves using the EEA as a temporary parking slot to buy time to negotiate a less-favourable Canada-style free trade agreement. The worst of this, though, is that advocates of this stratagem are wilfully discounting the complexity of setting up UK participation in the EEA as a member of Efta. In this context, we've written many times that the EEA is an adaptive framework. There is no single EEA Agreement which covers all Efta members. Each of the three nations have agreed their own specific adaptations to suit their own national requirements, with country-specific protocols and their own amendments to the Annexes. Should the UK seek to become an Efta/EEA member, it will need its own special adaptations, the nature of which have barely been discussed much less properly explored. For a start, we will need to be looking at factors such as customs cooperation, rules of origin and much more, all of which must be written into the EEA agreement via detailed protocols. Here, one should note that the most developed agreements lie with Norway and what is suitable for this country is not necessarily going to be adequate for the UK. The entire EEA acquis needs to be evaluated and then the changes needed must be assessed and then negotiated. One of the oft-cited advantages of taking up the Efta/EEA option is that it frees us from the grip of the Common Agricultural Policy (CAP), but – given the extensive two-way trade in agricultural goods between the UK and the rest of the EU - complete withdrawal from the CAP might not be such a good idea. Within the EEA Agreement, though, there is provision for cooperation in the agricultural sector and, if the UK is to maintain its trade links in farm products, it will need to negotiate an extensive new country-specific protocol to bolt on to the existing Agreement. That alone could take many months of tough talks before all parties were satisfied. Additionally, the Agreement makes provision for tariff-free trade, with certain product groups – notably agricultural goods – currently being excluded. The UK, undoubtedly, would need a far more comprehensive deal than is at present accommodated in the EEA Agreement. Finalising this will almost certainly add significant time to any talks. It also goes without saying that the UK will be required to settle a financial mechanism on the same lines as other Efta Members, establishing a system of payments to Eastern and Central European countries along the lines of the EEA and Norway grants. The scope and amounts will no doubt be hard-fought, taking many months before agreement is reached. Then there are the special arrangements for participation in the EU's range of agencies, and especially the European Aviation Safety Agency (EASA), which will have a significant impact on ongoing relations. Terms, and contributions, will also be hard-fought and it would be unrealistic to expect that all the details could be finalised easily or quickly – especially as we will want to go further in some respects than existing Efta/EEA states. On top of all this, it is unlikely that any arrangement can work without a comprehensive deal on VAT, going well beyond that which exists between Norway and the EU. This would need to be negotiated and rolled into a UK-specific protocol, again adding time to any negotiations. Whatever the actual outcome, it must also be obvious that the parties are not going to commit the time and resource to paving the way for the UK, only for the UK then to turn round end commence a completely different set of negotiations for an FTA, prior to walking away from the EEA completely. Any rational evaluation of the Boles scenario, therefore, makes it plain that it is an ill-thought-out scheme that cannot possibly work. To even suggest it is an unnecessary distraction and singularly unhelpful. If anything, it makes the Efta/EEA option even less likely to happen, at a time when it needs as many allies as it can get. Given the amount of time negotiations would take, it is extremely unlikely that we could conclude a deal by the end of next March. Nor can we rely on an extension of time under Article 50. About the only thing left to use therefore, is to take what we can get, by way of a Withdrawal Agreement, with the transition period and the backstop. That will then buy us time to negotiate Efta entry and customise the EEA Agreement. What would be particularly helpful here is that, since the Efta/EEA option is a whole-UK solution, it resolves the Northern Irish border problem, allowing for the free flow of goods and services – provided we have the additional protocols agreed. This, of course, would mean abandoning any ideas of negotiating a Canada-style agreement, and accepting that we will be part of the EEA system for a considerable time. That, however, does not prevent renegotiation of the EEA Agreement at some time in the future, or its further development, and if membership ever becomes intolerable, we only have to give a year's notice to leave. Attractive though it is, Booker's Efta/EEA option is not a magic wand, and much hard work will be required to make it happen. Nick Boles must abandon his belief that it is an easy, "plug and play" answer to our transition. It isn't. He needs to let the grown-ups do what is needed.